Fun and easy for kids to handle. Gel-formula glass stain is kid-friendly. Flows onto the sun catcher frame with squeeze-tube. 12 of each six vibrant colors. Color Splash!® gel-formula glass stain is fun and easy for kids to handle. Vibrant colors flow right onto the sun catcher frame with squeeze-tube design. Basic Colors Bulk Pack contains 12 each of blue, yellow, purple, red, orange and green. Non-toxic. Each tube contains .34 fl. oz. Set of 72. Protect skin, clothing, and work surfaces as this concentrate color may stain. I originally purchased other sun catcher stains from another company and they were all dried up when I got them. So I decided to go with the SS stains. 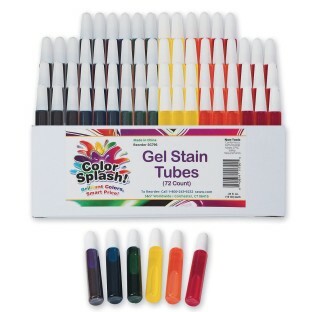 I liked the colors and the price was right for the number of tubes. They were a bit smaller that the ones I previously purchased and should have bought 2 sets of the SS to make up the difference. Over all they worked great but when you have small children using them they use way more than needed and I ran out very fast. Also I am glad I took the time to look at the product before the event because each tube had to have a stopper removed and that took time to get them ready for the event. It would have been a mess to try and get them ready they day of so take a day or 2 prior and have your tubes ready for use. Very easy to handle. made great sun catchers. Fun to use with children! We use it to create decorations cards and craft items with youth particiapnts in our after school program. Great variety for the headbands and other projects. Plenty to share for a big group.Stores easily. The paint made lots of bubbles that were impossible to remove. Paint thickens in bottle shortly after opening making it stringy and difficult to use. Only pro is the small container.